Mobile email management with auralis. Decide which devices are to be allowed access to the data on your groupware server (compatible with Exchange or another ActiveSync solution), and which employees can connect to the server with which devices. This authorisation is based on certificates – which means security at both ends! Assign user profiles in the intuitive administration interface. Allocate initial passwords, and your employees can now independently establish their connections. Immediately after the installation, the device begins synchronising emails, contacts and calendar entries via ActiveSync. Integrate auralis into your DMZ and prevent your Groupware server from being exposed to attacks from worldwide. 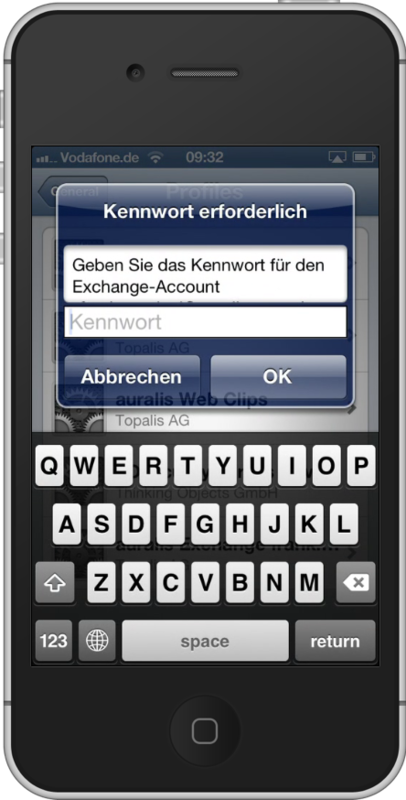 The mobile devices communicate with auralis only securely encrypted by SSL. 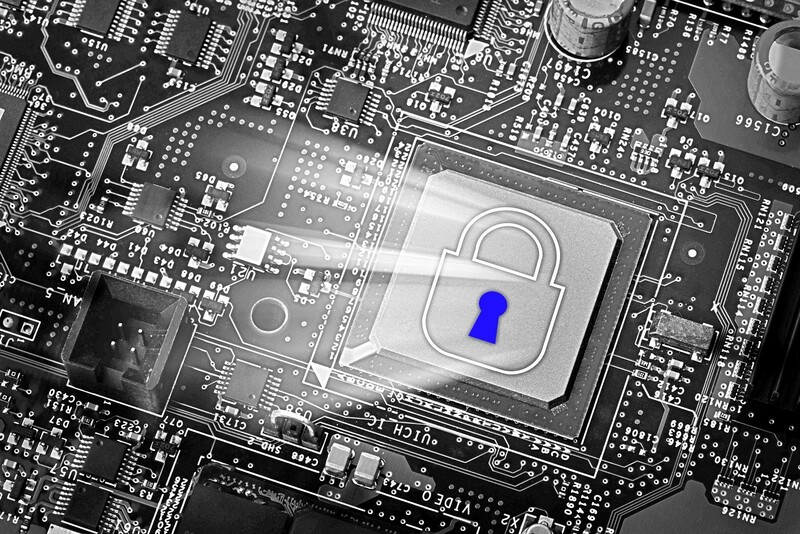 By integrating a proprietary certificate authority, or CA, own certificates are generated on all the devices for the established connection. This ensures that the smartphones and tablet PCs are securely connected. Man in-the middle attacks, a frequent problem in unsafe Wi-Fi networks, are therefore ruled out, and your users’ login credentials (user name and password) are protected. With the implementation of SCEP (Simple Certificate Enrollment Protocol), this process is fully automated during the rollout. By integrating auralis in your DMZ, you protect your groupware servers and prevent the direct and dangerous exposure of internal Web services on the internet. 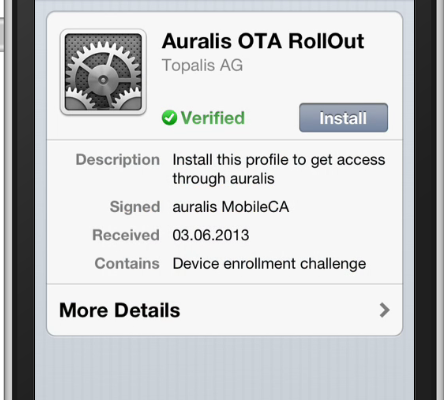 The communication between mobile devices and auralis is always encrypted via SSL. What groupware do you use? auralis functions as a gateway between your email infrastructure and the mobile user devices. 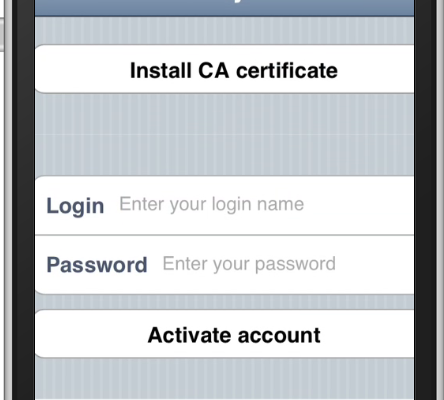 This means that you no longer have to expose the ActiveSync interface on the internet. auralis allows you to control how emails, calendars, and contacts can be synchronised with which smartphones and tablet PCs. It doesn’t matter what email server you use. 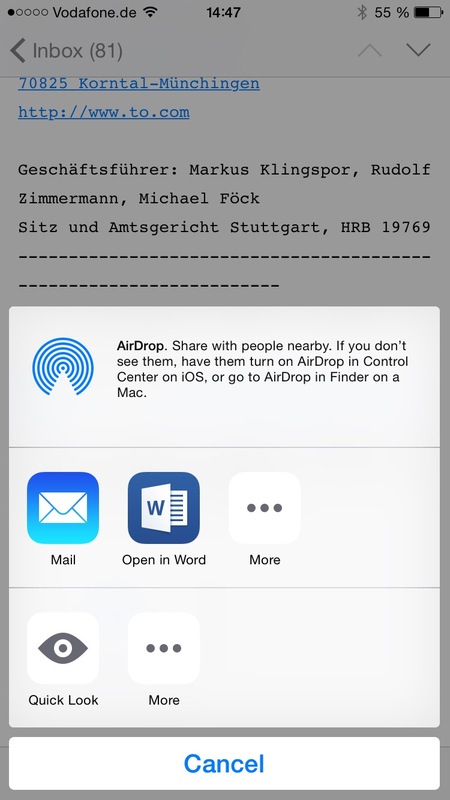 auralis works with any ActiveSync-compatible groupware. Our customers deploy Microsoft Exchange, Office 365, Lotus Notes, Kerio, Tobit, and Zarafa. What happens to the email attachments? 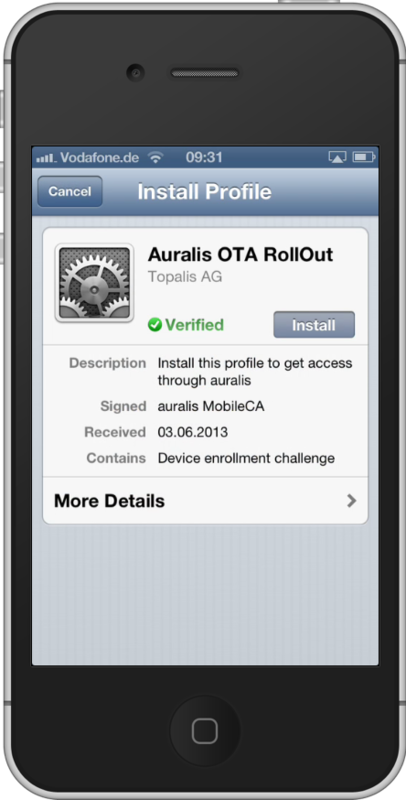 With auralis, you can define certain configurations for handling file attachments on iPhones & iPads. For example, if you permit your employees to set up private email accounts as well, you can prevent emails and attachments from being exchanged between the mailboxes. 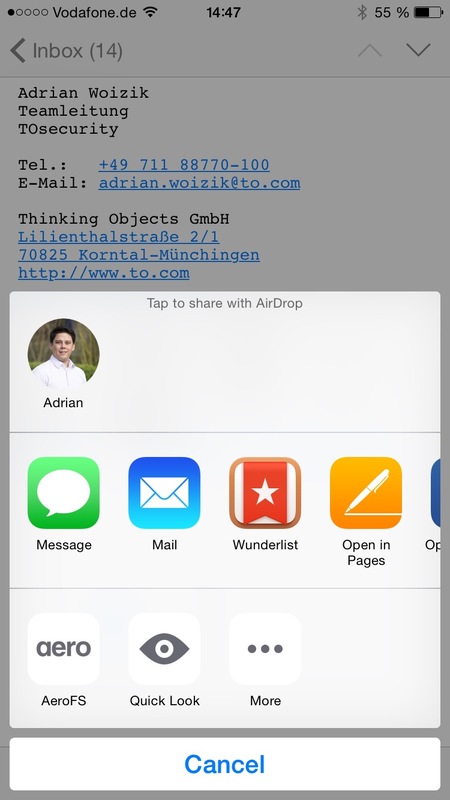 You don’t want attachments to be opened in any app? 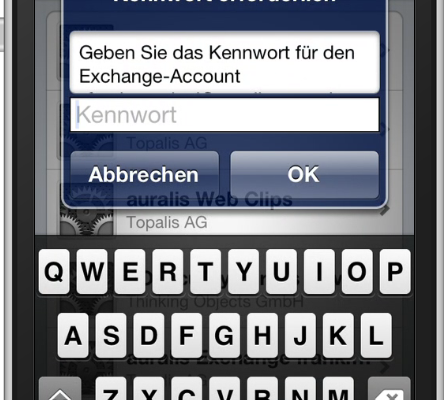 Then simply install the viewer of your choice as a managed app, and allow attachments to be opened only with that app. This prevents attachments from finding their way to other storage locations, and they are well and truly removed from the device after an enterprise wipe. You can see the difference in the screenshots. With and without this restriction. The email compression capability built into auralis allows you to not only reduce the size of attachments and minimise your data traffic. You can also completely filter out certain documents based on MIME types. This means that unwanted documents don’t get on your smartphones in the first place. auralis is your Mobile Email Management solution for iOS, Android & Windows Phone. Connect your user devices securely!